Monique Charlesworth, above right, has published four novels and written scripts for film and television. She lives in London with her husband, Alex Lifschutz, and has two grown-up children. 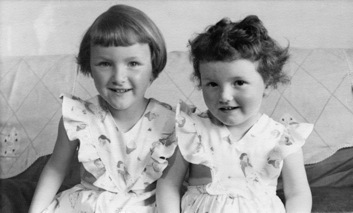 In my Birkenhead childhood, a blanket thrown on top of the dining table became a dark, warmish cave where two small girls evolved an alternative world. My big sister was – is – clever, and easily bored, and avid for entertainment. Not an easy audience. In the Mouse Kingdom saga, she eternally got to play the beautiful adventurous Princess Jemima while I – titular king of the mice – was known for being fat, and greedy. Still, providing I met her unreasonable criteria, she listened, while King Montmorency narrated. (Names were not my forte). Quite soon I learnt how to make the story twist and turn, laughing at my own jokes, crying at the sad bits. Half German (and brought up speaking French), I wanted to study English but chose languages because I was good at them. I lived in France and Germany for a time during the 1970's, those years of bearded student revolutionaries looking and trying to act like Che Guevara. For a decade after university, I earned a living as a technical journalist, but the kingdom of the mice always beckoned. When I followed my husband’s work to live in Hong Kong, there was time, and opportunity, to try fiction. How to begin? A group of clever young Americans in Paris in the 50’s had had the idea of visiting writers and asking them – with artful simplicity – not so much what they wrote (or why) but how? With a pencil or pen? In the morning or afternoon? The anonymous interviewers tracked their authors from garret to mansion describing the house, the room, the desk, the pen, the clothes, the face and the mannerisms. The Paris Review interviews on writers at work was a hit, demonstrating as it did that there was no one way. For every prolific early riser with 30 identically sharpened yellow pencils there was a late night, three-word blurred whisky man. E.M. Forster – then the great man of literature - explained why he had not finished a novel in thirty years. Who would have imagined in those pre-Wikipedia years that the prolix author of Catch-22 (1961) needed a first sentence before he could start a novel? And so it goes: Joseph Heller’s Something Happened could not happen until 1974. Asked for the source of her work, Dorothy Parker (most misleadingly) replied ‘Need of money, dear.’ The interviews are online now – and Paris Review tweets. In 1983, as brown-sailed junks sailed serenely by the old Star Ferry, I turned the last page of the last issue of The Paris Review. I knew everything and nothing. That week, with a huge effort, I did manage to get my character out of one room and into another. Alas, he had neither the allure nor the cunning manipulative skills of Princess Jemima. Very few people choose to write for a living; it’s more compulsive than that. Hard though it is, writing delivers incredible satisfaction. I'm still trying to please that demanding audience waiting under the table with a sardonic expression and a mouthful of biscuit. © 2019 Monique Charlesworth. All rights reserved.